Yesterday, I ran around town like a crazy lady hitting up stores for our Christmas box that we are packing for operation Christmas child. 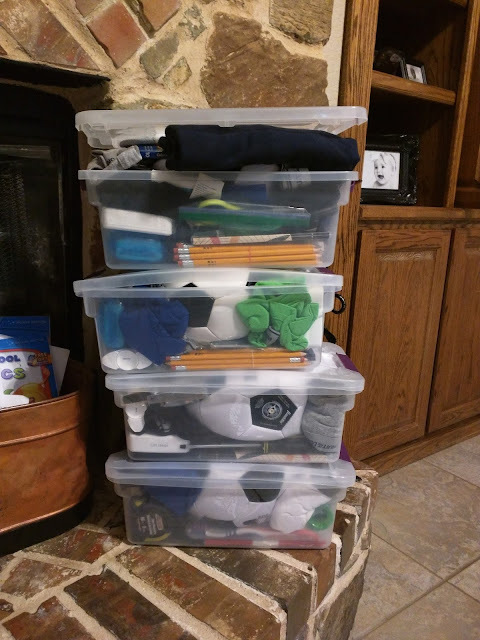 After I had gathered the supplies I waited for the kids to get home so we could pack these boxes together. The first thing we did was watched an informational video found on youtube so the kids would know why we were doing this. After they watched it Henry said, "Mom, I want to give a gift to them." My greediest child said that! And then we got to work. They sorted the supplies into four groups. We decided to do four boxes this year. One box per child and then we are giving two boxes in honor of some family members this Christmas (as there Christmas present). Remember my last post where I gave suggestions for gifts that give and I gave this gift suggestion... "Hey, you are the most generous person I know. I gave ____ to this ____ organization in your name!" Back to the story... The kids sorted the supplies into four groups. After the supplies were sorted, Lucy looked at me and said,"Mom, this is never going to fit in that box..." She was right. I had to take out the hammer, cup, and bowl. Below is everything that I got into a shoebox! 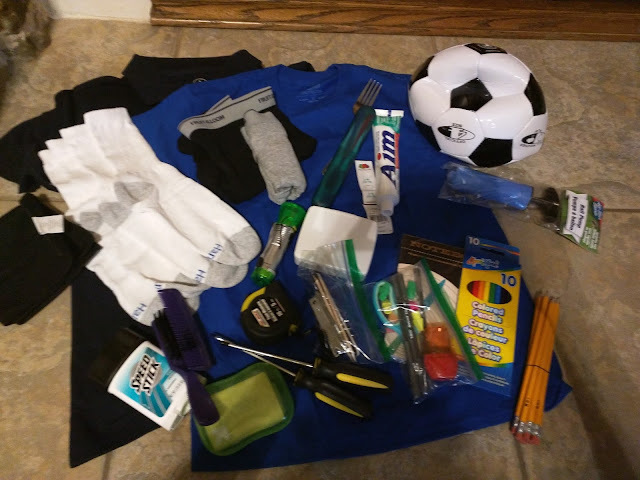 1 t-shirt, 1 collar shirt, 2 undies, 2 pairs of sox, a comb and brush, nail clipper set, deodorant, 2 toothbrushes in a toothbrush holder, 1 bar of ivory (because it floats) in a soap container, 2 screwdrivers, tape measure, flashlight, fork, first aid kit, journal, 10 pencils, 10 colored pencils, 3 pens, scissors, 6 erasers, 1 pencil sharpener, a soccer ball and a ball pump. 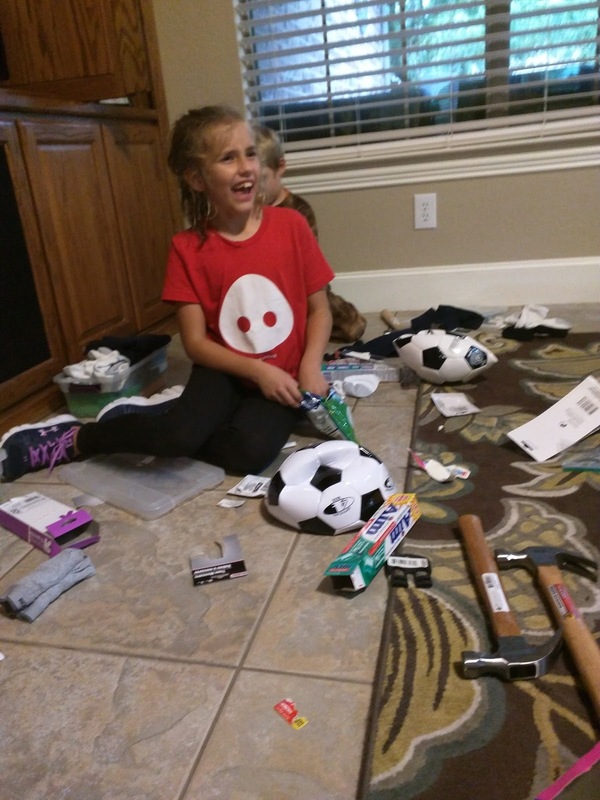 Supplies were found at Target, Walmart, and the dollar store. I love this ministry and I'm thankful that it is something we can all do together this holiday season. I want my kids to know how to show people Jesus and this is a small way they can do that. There is still time to participate!